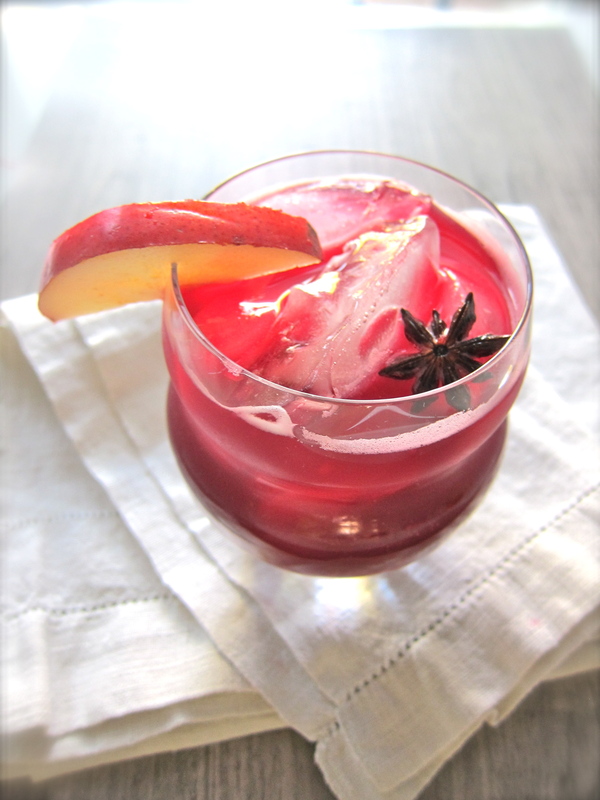 “Drinkable Food”…beautiful beet juice cocktail with pear & star anise garnish…. In a few days it will be December….D-e-c-e-m-b-e-r! November went by in a flash. I remember returning from a trip to Mexico…lots of food styling shoots…and the last Third Thursday Dinner Party of the year…and…oh, yeah…Thanksgiving. If anything could send you running to the home bar I believe November would be it. The need for a very deep red, but somewhat wholesome cocktail comes to my mind this time of year. 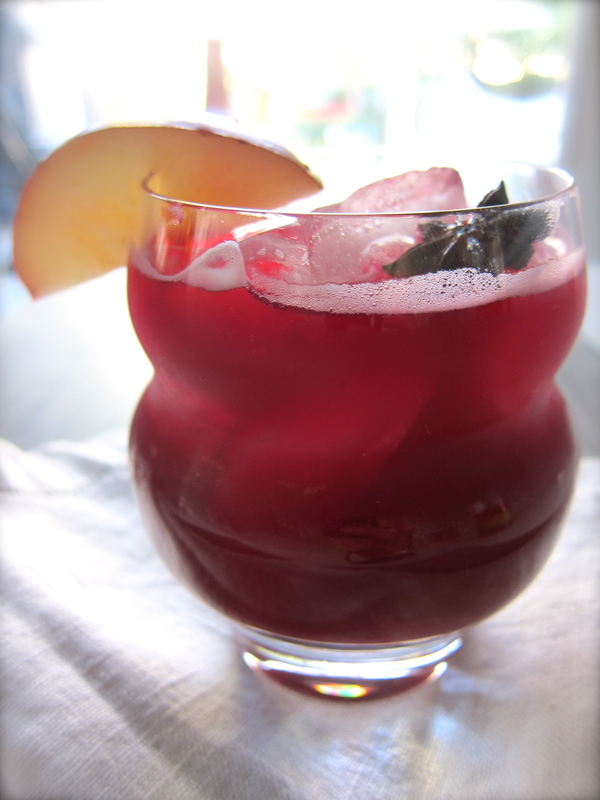 A cocktail that will give you vitamins & minerals while creating a sense of well-being & unreality! 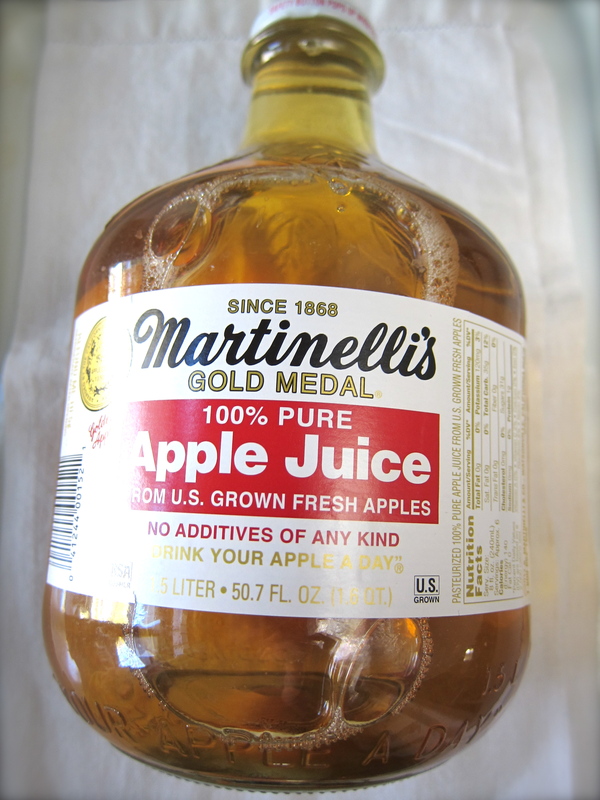 Basically a perfect cocktail to fortify one for what is to come between now and the New Year. A cocktail perfect for a party small or large. 1. 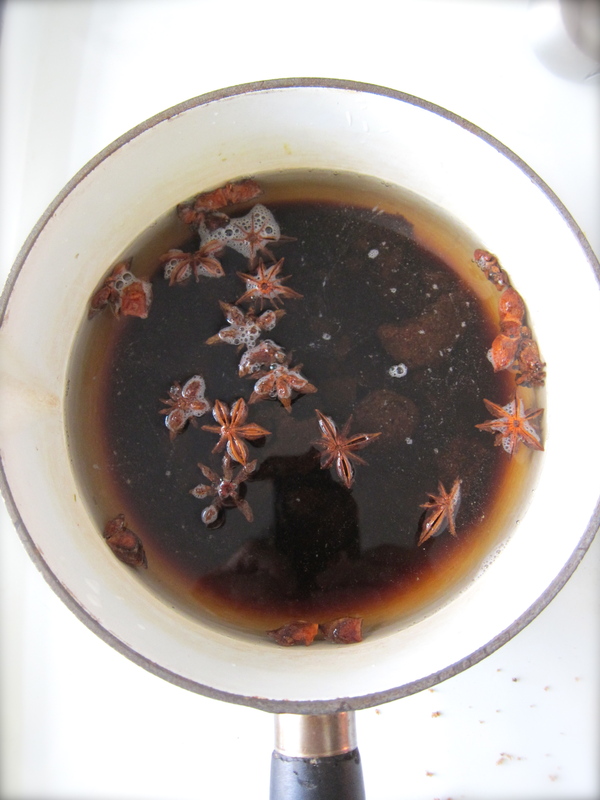 Make a simple syrup using 1 1/2 cup water, 5 or 6 whole star anise & 1 cup dark brown sugar. 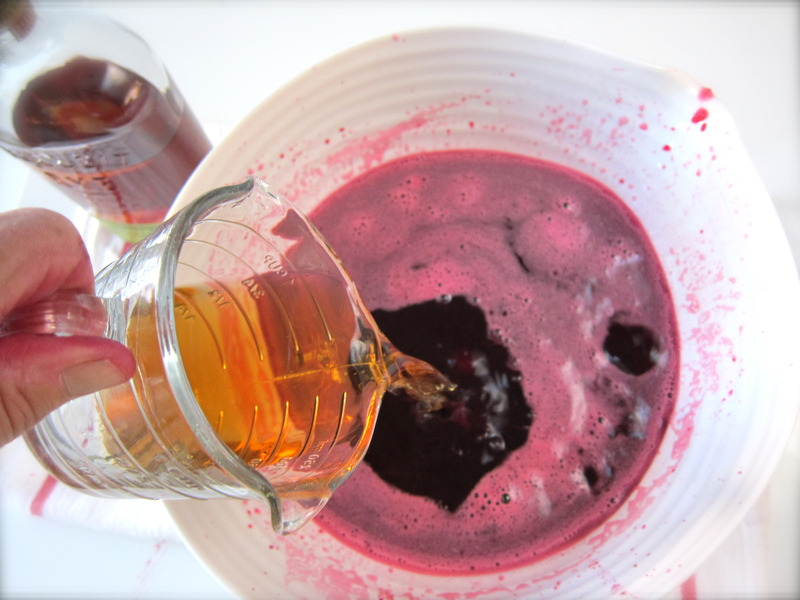 Bring water & sugar to a low boil, stirring until sugar is dissolved. Toss in star anise and simmer for about 20 to 30 minutes until mixture is syrupy. Remove from heat. Set aside to cool completely. Strain mixture to remove star anise. Put in a jar with a tight-fitting lid and chill until ready to use. 2. 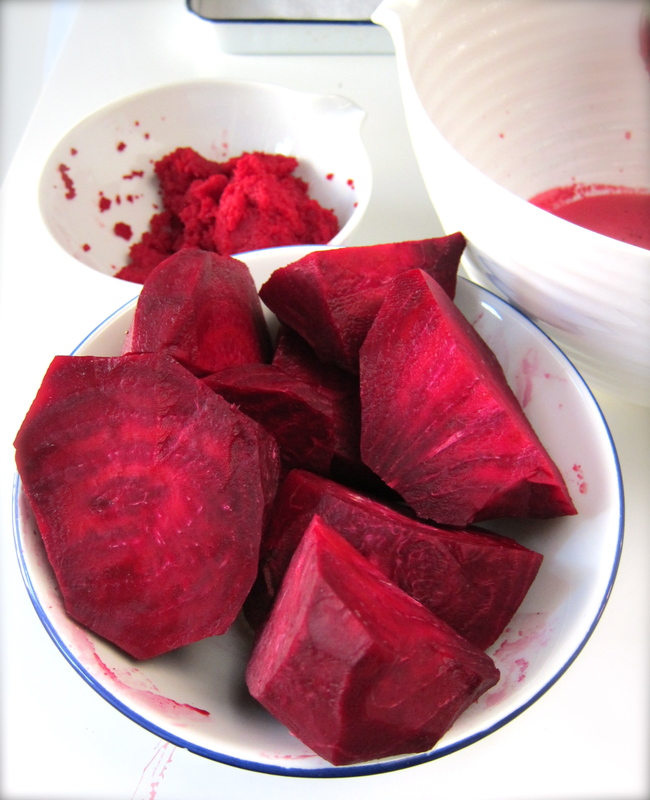 Peel 3 medium size fresh beets. Chop into large chunks. 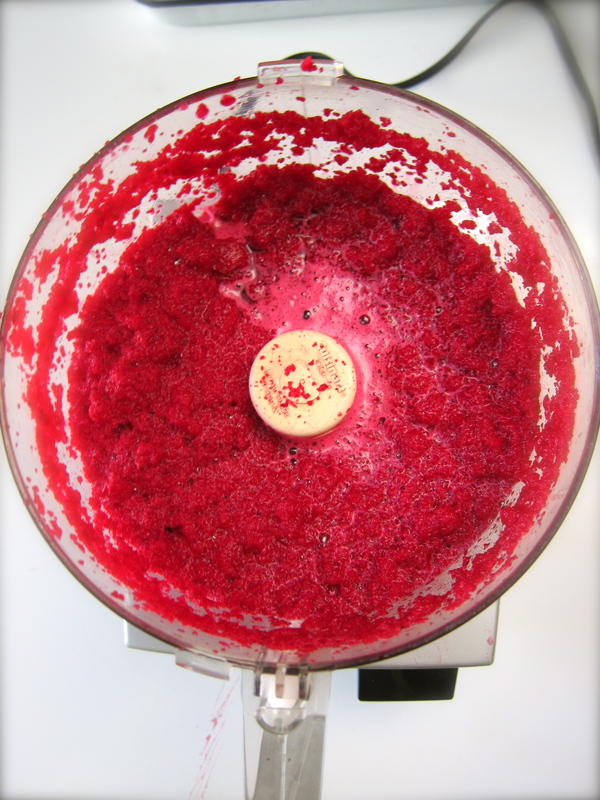 Puree using a food processor. You will probably have to work in batches. 3. 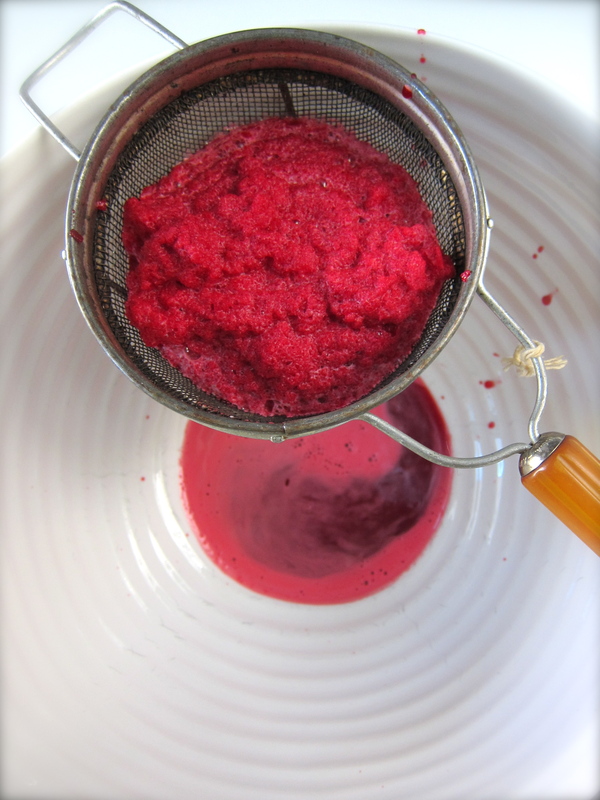 Strain pureed beets over a bowl, pressing pulp with a wooden spoon to release most of the juice. 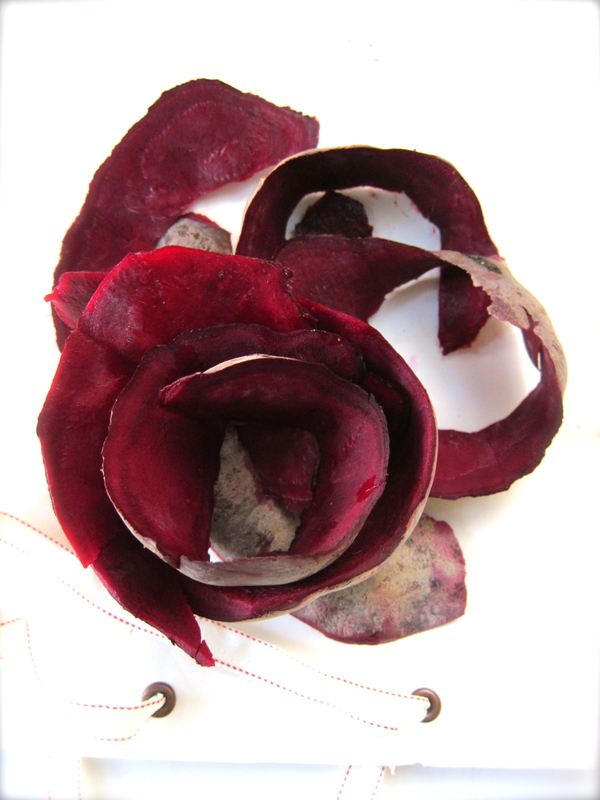 Don’t toss out that beet pulp! 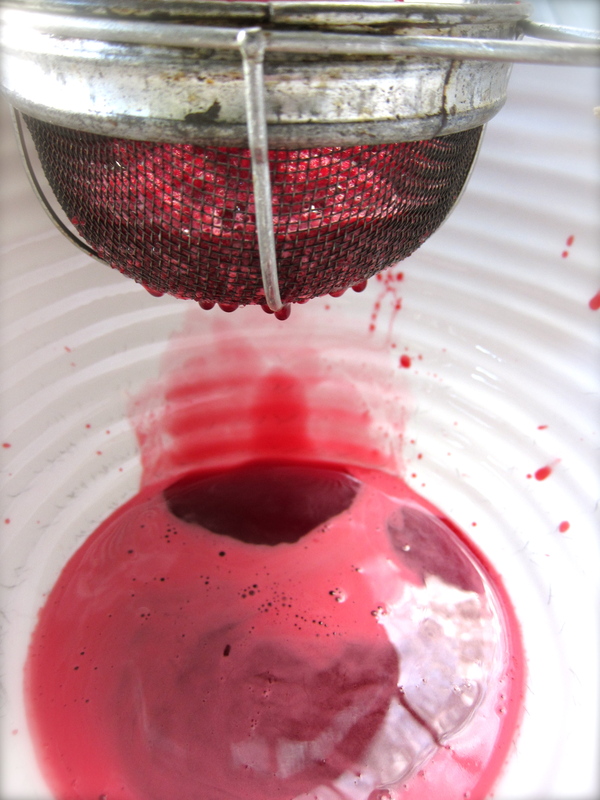 Fresh beet pulp is great in breads & cakes. 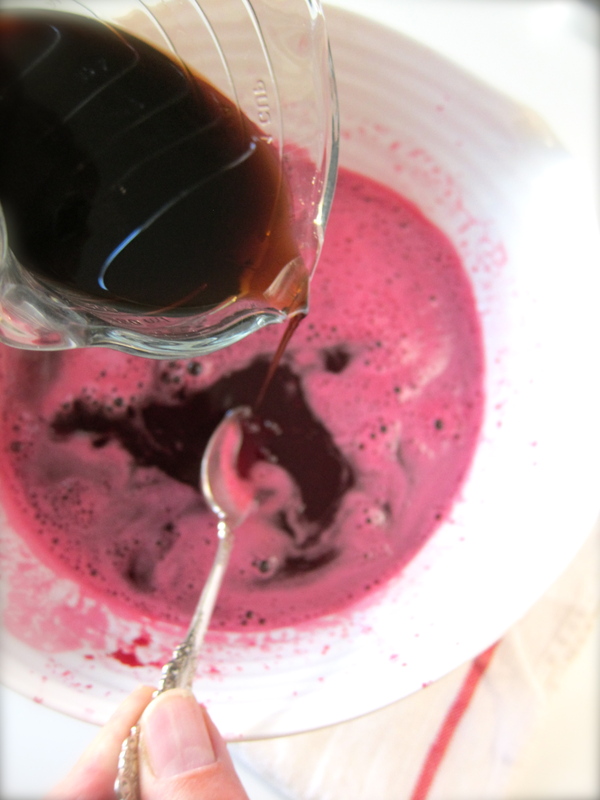 See Nigel Slater’s Book “Tender” or wait for my next blog to see how to make a killer chocolate cake using beet pulp. Freeze the pulp. As with most of my cocktail recipes this one is not an exact science project, but more a mix & taste project until I hit the “sweet spot”. 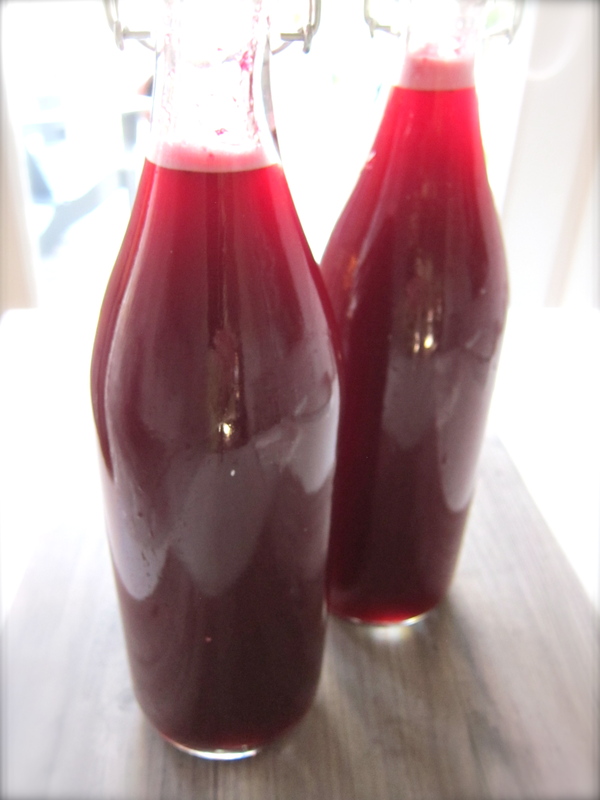 Is there any color of red more delicious than fresh beet juice? I think not. 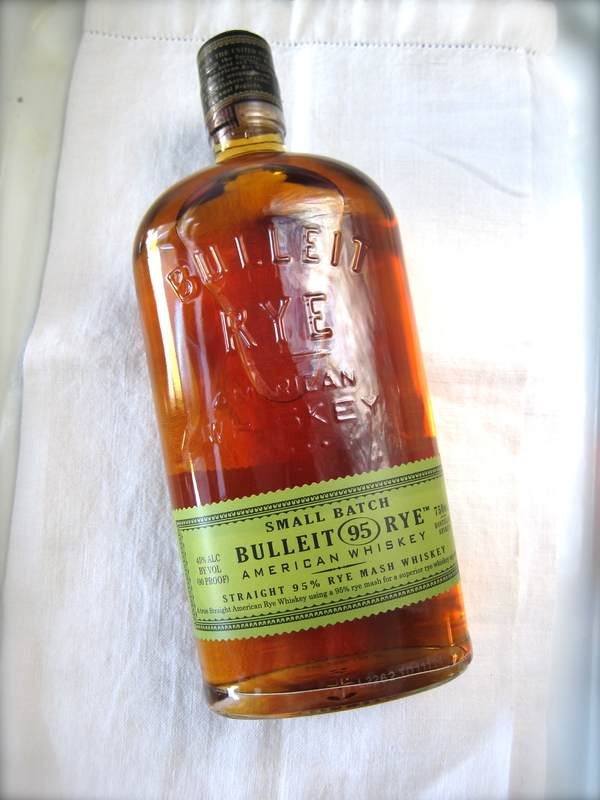 …..1.5 liter pure apple juice…..
….and 1.5 cups Bulleit Rye Whiskey. Taste & adjust to your liking. Decant into glass jars with tight-fitting lids. Chill until ready to drink. Add a label…or not. 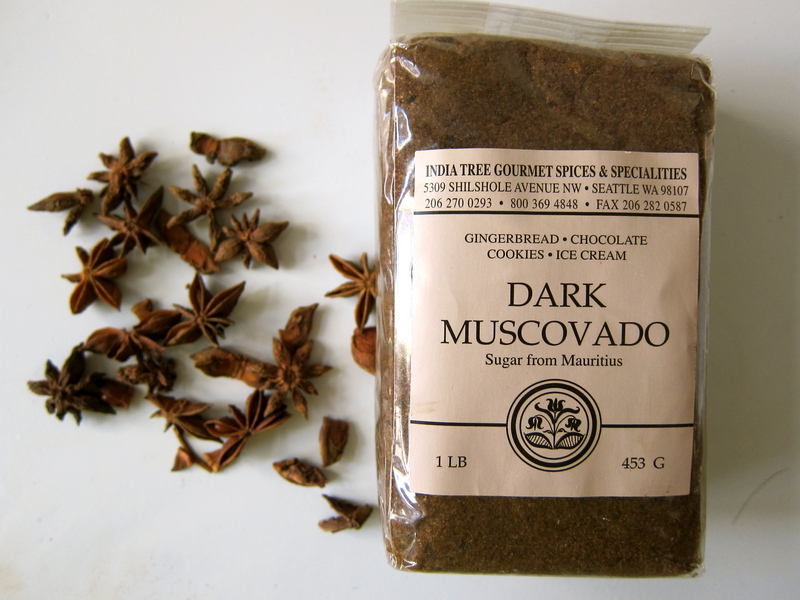 Great over ice with a star anise & slice of pear to garnish. Get ready, get fortified! It’s almost December….get your red on!